If you live in Canada, there’s no way to watch British shows via BBC iPlayer– unless you know how to “geo-hop.” Read on for a quick guide to geo-hopping that’ll show you how to watch BBC iPlayer in Canada. Which VPN service is the best one for accessing BBC iPlayer from Canada? Can the BBC block VPNs? You have to be wise about the VPN service you choose if you want to get to BBC content from Canada via iPlayer. Some VPN services are much better at getting past geo-blocks than others. ExpressVPN is the best and most reliable VPN for geo-hopping out there right now. The company is offering 3 months of free service, so you can try out ExpressVPN risk free and enjoy a reduced price if you decide to continue on as a subscriber. Interested in trying out ExpressVPN? You can now get three months of ExpressVPN for free when you purchase an annual plan. If you try it and you don’t like it, don’t stress. There’s a 30-day money back guarantee, no questions asked. Unlike most VPN services, ExpressVPN has custom-built VPN servers that specifically designed for streaming services. Plus, ExpressVPN’s support team is trained specifically to help their customers get around geo-blocks. To log into a UK server, select Change Location on the lower left-hand side of the window. If don’t already have a BBC iPlayer account, you’ll need to visit the iPlayer website and create one. Once you’re in, just pull up BBC iPlayer and pick out something to watch. BBC iPlayer is a streaming service that contains live TV feeds and video content from the UK’s British Broadcasting Corporation. The iPlayer app lets you live stream every BBC channel, including S4C, BBC Alba, BBC News, BBC Parliament, CBeebies, CBBC as well as BBC 1, 2, 3 and 4. 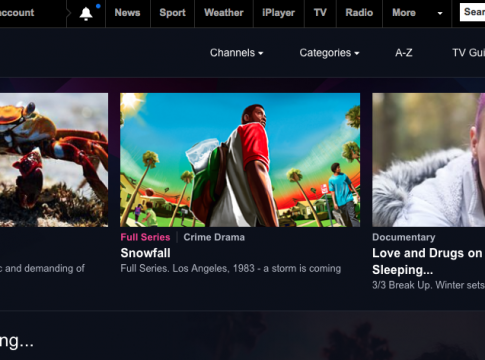 In addition to live channels, iPlayer also has on-demand shows and movies. Best of all: there are no monthly fees or annoying embedded advertisements. However, to use BBC iPlayer legally abroad you do have to buy a UK TV license. If you log into BBC iPlayer via your computer, you can switch live channels by clicking the channel icons located on the bottom of the screen. If there isn’t anything good on, you can opt to watch on-demand shows and films instead of live TV. The BBC’s film library is by no means vast, but it does contain a handful of recent flicks. Currently, Gone Girl, Mister John, Noah and several other new movies are available for streaming. Though BBC iPlayer’s on-demand library isn’t as big as Netflix’s or Hulu’s, it does contain titles you won’t find anywhere else. Movies and shows are available on iPlayer for around 30 days, and then they vanish and are replaced with new videos. Because ExpressVPN lets you blend in and look exactly like a non-VPN user from the perspective of the BBC’s servers, you won’t run into the “BBC iPlayer only works in the UK” error message while using ExpressVPN. VPN users that subscribe to VPN services that aren’t equipped with obfuscation, however, can be easily detected and blocked. From a common sense perspective, it’s hard to understand why the BBC would want to keep people from watching its iPlayer content. After all, more viewers means more potential ad revenue. So why does the BBC go through so much trouble to block non-UK residents? The answer boils down to content licensing issues. Without so-called “geo-blocks” (virtual walls that prevent users living in certain locations from accessing content in other areas), the way that the BBC distributes its shows would likely have to change. BBC movies and TV shows follow strict release schedules. A new BBC title first airs live, then it becomes available for streaming on BBC iPlayer. After a certain amount of time (usually 30 days) the BBC removes the title from iPlayer. Next, it offers the title as a download on Amazon, Britbox and other on-demand video services. If everyone everywhere could access BBC iPlayer, the BBC would have to adjust the way it does business. They’d also probably have to buy more video servers to accommodate an increase in the number of people accessing the iPlayer site. Another complication is that in the UK, everyone has to buy a TV license to watch TV legally – so the BBC would have to revamp their license fee collection system as well. Yet another problem for the BBC is that its iPlayer servers can likely only support a limited amount of viewers. If more people started using iPlayer, the BBC would have buy more hardware to support its expanded audience. The “geo-block” the BBC uses to keep Canadians (and anyone else located outside the UK) from using BBC iPlayer is actually not all that sophisticated. Essentially, the BBC’s geo-block is just a simple filter that blocks out non-UK IP addresses. IP addresses are like mailing addresses, in that they facilitate the flow of information from point A to point B. Every machine on the Internet has a unique IP address. Computers can’t communicate without them. If you try to load a BBC iPlayer using a computer that has a Canadian IP address, you’ll get geo-blocked. But if your computer has a UK IP address, you can easily use BBC iPlayer and access all the latest BBC shows. The easiest way to change your computer’s Canadian IP address into an British one is via the use of a VPN. If you log onto a British VPN server, it’ll look like you’re located in the UK when you go online. Once you’ve got a UK IP address, you’ll be able to access not only BBC iPlayer but also all the other licensed content that’s ordinarily only available in the UK. The BBC can – and often does – attempt to block known VPNs from accessing iPlayer. However, VPN blocks are easy to overcome. Unlike physical mailing addresses, VPN IP address are not permanent. Any VPN service provider can easily change all their servers’ IP addresses. All it takes is a few simple commands. As long as a VPN service provider is willing to play “whack-a-mole” with the BBC, it can react to and overcome any type of block that the BBC tries to implement. Additionally, VPN services that offer DO (Data Obfuscation) allow an additional layer of protection from VPN blocks. Obfuscation allows you to “blend in” with non-VPN users when you use a VPN. Our preferred VPN for geo-hopping used to offer obfuscation as an option, but now obfuscation seems to be enabled by default. Because there’s no way to turn obfuscation off, its entire user base is likely totally invisible. Features like dynamic IP addresses, UK-based VPN servers, configurable ports and built-in obfuscation help ExpressVPN subscribers overcome pesky geo-blocks. All of ExpressVPN’s UK servers have dynamic IP address, which means that they change constantly. Even if the BBC someday finds a way to pierce through the obfuscation and identify the IP addresses, they’d have to update their firewall constantly to keep up with the changes. The more servers that a VPN service has, the better. If a VPN service doesn’t have enough servers to keep up with demand, connection speeds will slow. ExpressVPN doesn’t have that problem. ExpressVPN seems to have perfected obfuscation to the point where they’ve likely enabled it by default and removed the ability to disable it. As a result, when ExpressVPN users access BBC iPlayer, there is no way for the BBC’s computer techs to figure out that your connection is running through a VPN. Unlike fly-by-night VPN services, ExpressVPN offers immediate live support via chat. If you encounter an issue, just hop over to the ExpressVPN site and open up a chat window. In addition to all the benefits listed above, ExpressVPN has another key feature: a money-back guarantee. You can get your money back within 30 days for any reason after signing up. Once you get an ExpressVPN account, just login and verify for yourself that you can get to BBC iPlayer. If there are any problems, you can just cancel and get a full refund. Services that don’t offer a money-back guarantee are typically just out to take your money. But because ExpressVPN really works, the company is confident enough to offer a satisfaction guarantee. Here’s a quick summary of what to do if you run into problems using BBC iPlayer while connected to ExpressVPN. In addition to cache, your time zone also provides a clue about your location. Changing your system time to GMT (Greenwich Mean Time) is a second workaround you can try if you run into any errors. The BBC built a virtual wall around their content for licensing reasons. However, because the BBC’s geo-block relies primarily on IP address filters, it’s pretty easy to beat with ExpressVPN. ExpressVPN’s security features are more advanced compared to most other VPN services. Because all of ExpressVPN’s UK-area servers have dynamic IP addresses and the ExpressVPN client is data obfuscation capable, this VPN service can overcome just about any geo-block on the web. In addition to being just as quick as its name implies, ExpressVPN is also fairly easy to install and use. Once you install and configure the client, all you have to do is log into a UK server to get started.